Critics fear changes to the Health Bill will make the NHS more complicated. 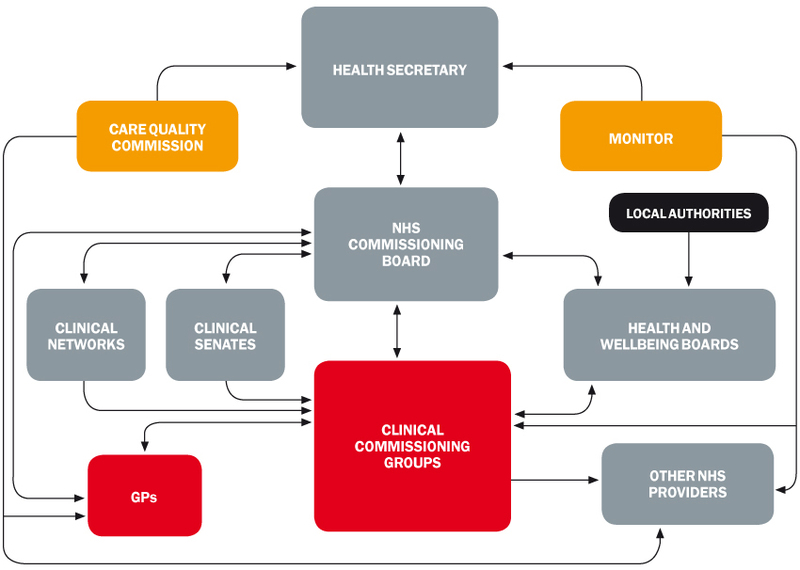 From clinical commissioning groups to Monitor, GPonline.com unravels how it will work. Click on the boxes below in our organisation chart for more details. Critics feared plans to limit direct political control over the NHS would cut accountability. The DoH has said the health secretary will have a duty to promote a comprehensive NHS and powers to report on NHS performance and intervene in case of significant failure. Regulates all health and social care providers. NHS providers must register with the Care Quality Commission and meet quality standards. Those failing to do so could face fines, warnings or closure. NHS Commissioning Board is nationally accountable for NHS outcomes. Will hold commissioning groups to account and intervene if they are failing. England will have around 15 of these regional groups of doctors, nurses, public health and social care experts. Clinical senates will oversee local NHS decisions. Commissioning groups will be expected to follow their advice. Clinial networks will cover particular pathways or conditions, such as cancer care. The DoH plans to extend networks to cover more specialist areas. Clinical Commissioning Groups must be approved by NHS Commissioning Board - with input from clinical senates and health and wellbeing boards - to become statutory bodies. No longer called GP consortia, they must involve GPs, other professional groups and lay members to design services that provide the best quality of care and health outcomes. Responsible for arranging emergency and urgent care services within their boundaries and for commissioning services for unregistered patients. Must use 'NHS' in their name and have a clear link to their locality. All practices must join a clinical commissioning group. Part of GP income may depend on the group's performance. GP contracts will be held by the NHS Commissioning Board, but their clinical commissioning group will set local targets and monitor practices' performance. Monitor's core duty will be to protect and promote patients' interests. Monitor will do so by promoting provision of economic, efficient and effective care. Aims to maintain and, if possible, improve quality of services. Will promote fair competition for services and integration where this benefits patients. Will maintain role assessing and approving foundation trusts. Local authorities will decide the proportion of health and wellbeing board members who are elected local councillors, and DoH advice makes clear they will be ‘free to insist’ that a majority of board members are councillors. Reforms outside the Health Bill will extend local authority powers to scrutinise NHS decision making, allowing them to challenge plans for reconfiguration of services. Health and wellbeing boards will be controlled by local authorities and will link local councillors with commissioning groups. They will develop a joint health and wellbeing strategy, to which commissioning boards must work. They will promote integration between health, public health and social care. There are likely to be 152 - one for each former PCT. Commissioning groups will buy the services their local populations need from hospitals and other providers of NHS services, at fixed tariff prices.